Brains fold in on themselves as they grow. That’s just what they do. How and why they do it is a different story, and studying it requires some pretty interesting science. Science like growing simple mini-brains on a chip under a microscope. Israeli scientists wanted to study brain folding from a physics perspective. Growing brain cells for study can be difficult, though—so they came up with a solution to overcome this obstacle. “Here, we present an on-chip approach, which enables development of human brain organoids to millimeter diameter,” the team of researchers led by Orly Reiner at the Weizmann Institute of Science in Israel wrote in the study published recently in Nature Physics. Organoids aren’t entire miniature organs. Rather, they’re collections of stem cells that develop into the specific organ cells. Scientists can use organoids to perform lab tests of how organs function or react to treatments in the lab. But organoids aren’t perfect. Millimeter-scale brain organoids can die without access to blood vessels, and thick tissue can be difficult to image with microscopes, according to the paper. The “chip” can solve that problem. It’s a 150-micrometer-thick, gel-lined plate, topped with stem cells and then a cover. The cells begin developing in two dimensions into brain cells, but only grow along the confined space. 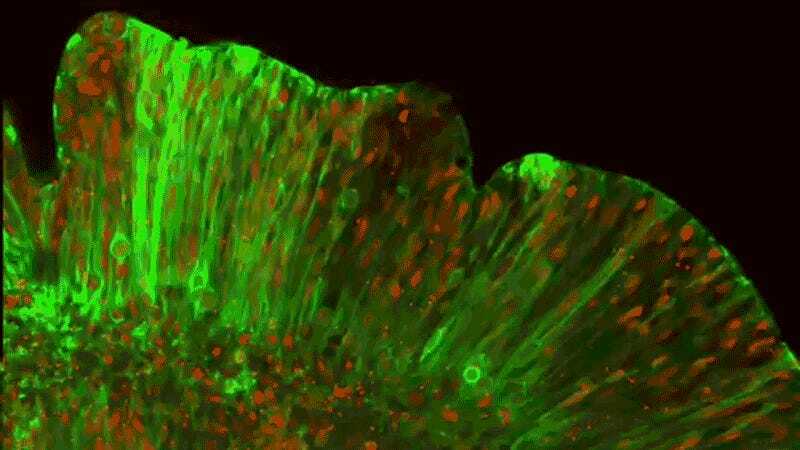 Basically, by confining the growth to two dimensions, researchers were able to watch a developing set of stem cells turn into brain cells and fold. Why are the organoids folding? It appears that as the neurons develop, their cellular nuclei migrate to the outer end. As this occurs, the whole structure appears to buckle and fold inwards. The phenomenon on the chip looks really similar to the folding effect of regular brains. Brains themselves need to fold, we think, for increased surface area—more brain processing power in a smaller space. But, again, organoids are not brains—not even tiny brains. In real brains, entire cells are arranging themselves to form much larger structures. “Significant differences in scale and structure, however, may limit the ways in which organoids can be used to study the mechanics of cortical folding,” Larry Taber, researcher in Biomedical Engineering at Washington University in St. Louis wrote in a Nature Physics News and Views. But these models are still important. They may shed light on fetal brain-shape development, or one day help explain why animals in the same species have similar brain folds, he writes.